Jack was born Deaf and is the only Deaf person in his family. He graduated from Concordia University in Film Production in 2009 and uses both spoken and visual languages. 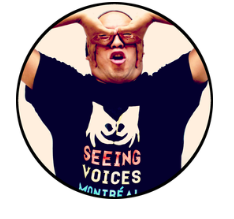 He is one of the founding partners of Seeing Voices Montreal (SVM), a community organization that raises D/deaf awareness through performing arts, education, and social interactions. Passionate about scriptwriting and directing, he is an expert in slapstick comedy. He currently works as a Personal Needs Caregiver, and also teaches ASL courses at MAB-Mackay Rehabilitation Center and Seeing Voices Montreal. 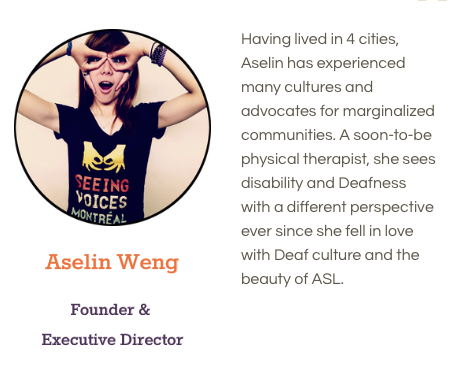 He and Aselin recently organized the “Awakening Deaf Theatre Conference” in Montreal in November 2018. Now living in Montreal via a stint in Vancouver, Taiwan-born Aselin Weng co-founded Seeing Voices Montreal with Jack Volpe while working on her Master’s Degree in physiotherapy at McGill University. Later admitted to McGill’s Faculty of Medicine, she is currently in her third year of Studies there. Aselin served as producer for Seeing Voices Montreal production of the play “The Little Mermaid” and continues to run this non-profit organization. 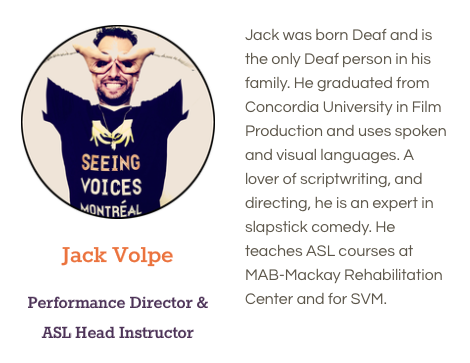 She and Jack recently organized the “Awakening Deaf Theatre Conference” in Montreal in November 2018. 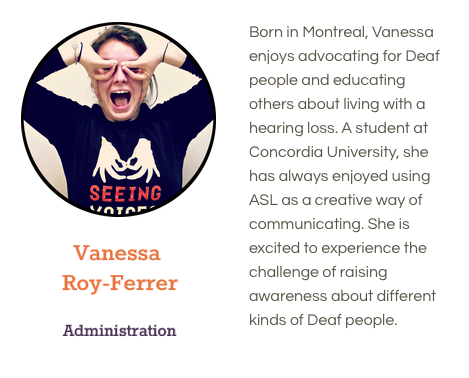 Born deaf, Vanessa’s first language was ASL until she received a cochlear implant at age 3 ½ . She grew up communicating orally and only started relearning ASL in recent years. We tracked Vanessa’s first time acting in ASL, and her challenges in feeling caught between the Deaf and hearing world. Born in Lebanon, Sera moved to Montreal at age 13. 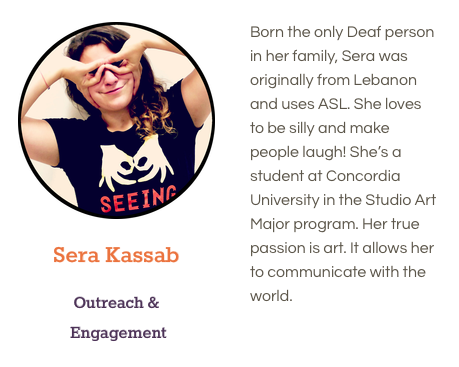 Deaf since birth, Sera learned American Sign Language in Canada. We followed Sera as she studied Visual Arts at Concordia University and brought her artistic vision to the play. 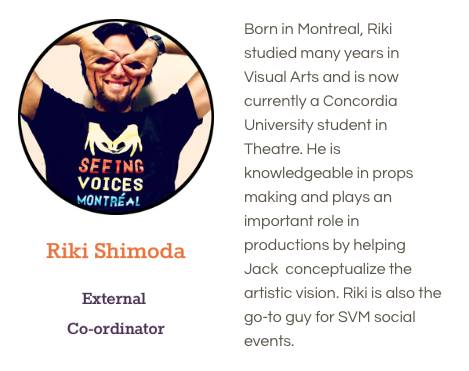 A student in Design for Theatre at Concordia University, Riki comes from a background in visual arts. He recently developed a passion for American Sign Language and Deaf culture. His challenge? Finding ways to make the play work on an artistic level for both hearing and Deaf audiences. Born in Peru, Ericko is the only Deaf person in his family. He speaks Spanish, French, English and uses LSQ and ASL. His interest is helping to break communication barriers. We followed Ericko off-stage as he faced challenges in finding employment in a world not used to hiring Deaf employees.